There is a popular way of thinking about repentance for many Christians today which relegates repentance to a single, specific occurrence in the believer’s life: that of salvation. This notion runs in stark contrast to most sacramental, or high church, traditions, east and west alike, where repentance is treated as a lifelong practice. For Orthodox Christians it could be said that repentance is imbedded in the fiber of their daily life with God. There is not a Church service, a sacrament, or even a prayer that does not involve repentance on some level. At the heart of the Orthodox emphasis on repentance is the knowledge of the innumerable ways in which a person can separate himself or herself from the life of God. Following the creation account in Genesis, when man was created in the image and likeness of God, the Orthodox view each person as having retained the image of God and having lost the likeness of God after the fall. The image of God is reflected in the attributes which distinguish mankind from the animal kingdom: reason, free will, moral and ethical responsibility, etc. However, the likeness of God relates to God’s “life”. This likeness was lost through Adam’s sin resulting in slavery to corruption and death. For the Orthodox, repentance is the key to both growing in and retaining the life of God. As mentioned above, the Orthodox believer has constant encounters with repentance as a centerpiece of the faith. 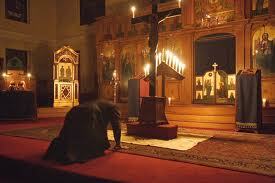 Orthodox liturgies are filled with worship couched in an attitude of repentance. Every service opens with three prayers, each of which includes a petition of repentance for transgressions, followed by numerous prayers for mercy. Each of the seven sacraments practiced by the Orthodox Church involves repentance for the purpose of readying the participant’s heart to receive from God. Then, if one follows the Orthodox daily prayers, he or she will find an abundance of penitent supplications mirroring the Psalms. Taking a closer look at the sacrament of confession reveals much of the Orthodox understanding of repentance as a whole. To begin with, the sacrament is found in some of the earliest records of the Church. Following the Apostolic tradition, the early Church perceived confession to be a direct link in the healing of both soul and body (James 5:16 and 1 John 1:9). So strong is the belief in the healing quality of confession, that the rite often precedes the other sacraments as well. For example, prior to baptism and chrismation the believers engages in their first sacrament of confession; the idea is that repentance makes the heart ready to receive the cleansing waters of baptism. Many Orthodox saints throughout history spoke of the “baptism of tears,” which some regard as baptism in its truest form—the grace of tears produced from an attitude of solemn repentance made holy by God for the cleaning of sin. Prior to partaking of the Eucharist the Orthodox believer will participate in confession, and if not in formal confession he or she will pray together with the congregation repentant-rich communion prayers as part of the Divine Liturgy just before approaching the Eucharist. Confession: Communal or Private Affair? Early on, the sacrament of confession was a public affair; a penitent would literally confess his or her sins before the entire congregation. It didn’t take long for this practice to prove itself indecent as it tended to scandalize many in the Church. Eventually the Church saw fit to have private confession between the priest and the penitent. As an added bonus to the “safer” setting created by this change, it also gave the penitent an opportunity to have what today we might call individual counseling. After the penitent confessed his or her sins the priest would pray and then have an opportunity to provide one-on-one spiritual guidance. And, if the situation warranted, this guidance would include prescribing acts of penance. Penance served as a means of discipline for the mind and body; a way for the individual to engage in combat against his or her evil passions, and, if the sin was of such a nature that it resulted in broken fellowship with the Church community, it served a way of return to the Eucharistic communion. It should be noted that in most cases today penance is omitted, as it typically does not serve an essential function of the sacrament. Whatever you have said to my humble person, and whatever you have failed to say, whether through ignorance or forgetfulness, whatever it may be, may God forgive you in this world and the next… Have no further anxiety; go in peace. May Our Lord and God, Jesus Christ, through the grace and bounties of His love towards mankind, forgive you, my child, all your transgressions. And I, an unworthy priest, through the power given me by Him, forgive and absolve you from all your sins. As noted by Timothy Ware, this Latin influence of using the word “I” was introduced into the Orthodox formula by Peter of Moghila in the Ukraine in the eighteenth century, and was thereafter adopted by the Russian Orthodox Church. Its inclusion in the rite is highly contested by many Orthodox. But regardless of the controversy, both formulas present the priest as a “humble person,” as an “unworthy priest,” one who is powerless in his own effort to forgive sins. 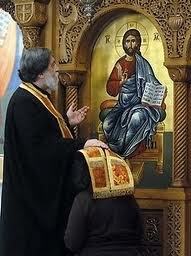 The priest accompanies the penitent into the presence of Christ as a spiritual guide. There is a true mark of the intimate communion between the penitent, the priest, and God. As in all the sacraments of the Church, this sacrament is performed as an ecclesial event; the priest is present as a representative of the Church as a whole. Thus, as private and autonomous as repentance is on the surface, the sacrament of confession reveals that repentance is actually a matter of communal significance with the entire Body of Christ. It is the mystical reality of the fact that when one member suffers, all suffer with him; and when one member is healed, all are healed with him. Nowhere do priests have any authority to forgive or absolve sins. The idea of a separate priesthood is not to be found in the Scriptures to the gentiles. If by maintaining the grace given to us as a gift you mean not offending that grace then I would wholeheartedly agree but if you mean maintain as in keeping the gift or not losing the gift then I would say that grace is not dependent on our actions but it is given in spite of our actions. You talk about repentance as if it depended on our so-called free will and yet repentance itself is a gift and therefore cannot be exercised unless it is given to us. This is to say that in every way our salvation is dependent on God alone and not on whether or not we have repented enough. R. Fowler, thank you for your response. You bring up many things. None of them are in the form of a question, so I’m not sure if you were desiring a response or just wanted to set the record straight, as it were. I’d be happy to help clear up any confusion if need be, as all of your comments have fairly straight forward responses (some of them already contained in the article). But if I could have you clarify one point that you made: You imply that we do not have free will to repent, yet also said that repentance is a gift and therefore cannot be “exercised” unless it is given to us. Could you explain what you mean by “exercise” outside of the context of free will? It might be a good thing for me to address some of R. Fowler’s points above for those reading along who may have similar push-backs. Fowler represents a Reformed (Calvinistic) influenced theology and, to be sure, Reformed theology has very little room to see these elements in Scripture as their theological worldview just simply precludes them. For example, that the New Testament does not present a priesthood and especially not one to the Gentiles flies in the face of so much Scripture its difficult to know where to begin. Christ is our High Priest. High Priest of what? Well, of a priesthood of course, one that was inaugurated, as jb above mentioned, in John the 20th chapter when Jesus anoints His disciples and gives them the power of the priesthood. This anointing was transferred through the laying on of hands by the Apostles to the various bishops they appointed throughout the world. These bishops then passed the appointment on to those whom were worthy and so on. This is demonstrated throughout the New Testament and is witnessed to by the Church Fathers and by the fact that the Church has always understood this to be the case. These was never a time when the Church did not believe in a priesthood. And of course this priesthood is shared with supposed Gentiles for the simple fact that in Christ there is no longer Jew or Gentile. To the second part of Fowler’s reply, he is presenting an idea of salvation and grace which also do not find traction in the historic Church and caused extreme contradiction with Scripture. Grace is not a created entity or state which God forces on people, one that cannot be resisted and one that has no bearing whatsoever on a person’s cooperation. Grace is the gift of God himself – it is the uncreated energy of God. God does not wed himself to puppets; He weds himself to a Bride, a fully cooperative Bride who not only desires participation with her Groom but is expected to participate by her Groom (God). Further, salvation is not a static event, it is a continuous journey, it is a matter of deification (see my other blog article on the subject). Thus to say that our salvation is dependent on God alone sounds noble, sounds like a defense of God’s sovereignty, but is in fact a slap in God’s face. God calls all people to repentance, and yes, he gives them the ability to repent. But if the person does nothing with the gift then the gift remains unable to save. It’s like a man thrown in a pit which he cannot climb out of. Along comes a person with a rope and tells the man to grab on while he pulls him out. If the man decides to grab on then he will surely be saved, but he would be quite moronic to imagine that it was by his own effort that he was saved. Without the rope and without the other man pulling him out he wouldn’t have a chance. Salvation is grabbing the rope and not letting go. That’s a quick response. If Fowler has any questions I’ll be more than happy to help answer them if I can.